A new report from BI Intelligence on location-mobile marketing takes a look at key stats on the location-based services marketplace that indicate it’s supremacy in mobile marketing, explain how the most important techniques (such as geo-aware, geo-fenced, audience-based local-mobile campaigns) work, examine the cornerstones – such as data and audience building – to a successful location-based mobile strategy, look at who has the valuable location-based data, and analyze the six most effective local-mobile marketing tactics. Location is the new cookie: Collecting data has always been difficult because mobile does not support third-party cookies that travel easily across the ecosystem, allowing for straightforward tracking and data-gathering. That’s where location-based mobile technology comes in. It gives marketers new ways to identify and track mobile audiences, and with the aid of algorithms, it can also group them into behavioral and demographic segments for targeting. Money is flowing into location-based mobile marketing: A recent survey of 400 brand executives by Balihoo found that 91% planned to increase their investments in location-based marketing campaigns in 2013. 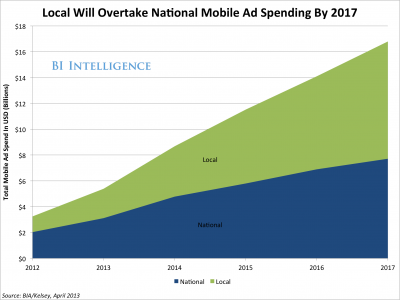 Finally, a study by Berg Insight found that location-enabled ad spend reached about 8% of total mobile ad spend for 2012. This proportion is expected to increase to 33% by 2017. Location-based data is driving much of the interest – and success: Enabling campaigns with local data produces measurable results. In a study of over 2,500 of its mobile marketing campaigns, Verve found that its location-based ad efforts were about twice as effective as the mobile industry average click-through rate (CTR) of 0.4%. Geo-aware ads, geo-fenced ads, and location data paired with audience demographics or purchase intent are all proving to be extremely successful. Location is extending beyond the smartphone: The location conversation may have started out as a way to take advantage of mobile phones, but as technology continues to evolve, the conversation needs to broaden. In 2012, only 12% of smartphone owners and 17% of tablet owners said they used their device throughout the entire shopping process. This year, one-third of smartphone and tablet owners said they did so. Additionally, more tablet consumers are beginning their shopping process on their tablets. This shows that location ads should be targeted to tablets as well as smartphones, because the first search for a local business might take place on a tablet.